Heather and Rob’s wintry engagement session at Ridley Creek State Park located in Media, Pennsylvania. Amy and Joe’s gorgeous winter wedding at the Windrift Hotel in Avalon. Joe and Amy wanted a gorgeous location for their engagement photos with lots of greenery and somewhere their pups could enjoy as well. They came up with the gorgeous Ridley Creek State Park in Pennsylvania and I'm so glad they did! The Hunting Hill Mansion at Ridley Creek State Park, is now used as a wedding venue, and my goodness, how could you go wrong with such a stunning backdrop? Amy and Joe are so much fun to be around- joking every minute, so grabbing smiles was not an issue! 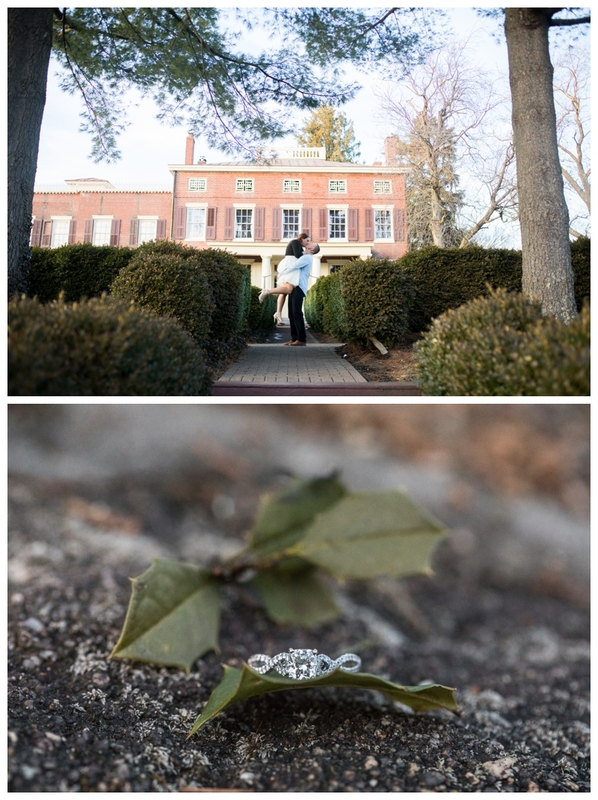 Cheers to Amy and Joe’s gorgeous Ridley Creek engagement session! Sometimes it’s really funny how things work out- on the day that my family officially moved to Medford, I had Katie and Joe’s engagement session… in Medford! We started out at Cathedral of the Woods in Medford Lakes, which has gorgeous gardens and just completely peaceful and quiet. They brought along their pup, Koda, who was camera ready with his bowtie and just so excited to a part of the engagement session. After an outfit change and a short car ride, we arrived to Lake 3 to watch the sunset. Katie and Joe strolled along the beach and cuddled on the docks, which made for some Nicholas Sparks worthy moments. What a great way to feel so welcomed into my new neck of the woods. I’m beyond excited for their wedding in June 2019! That weekend was filled with rain- so when Katie told me her and Dave were okay with rain during their engagement session, it was a relief! We tried to work around the forecast, but it pretty much rained their entire session- just enough rain where you need an umbrella. I'm so glad they were into it! Not only were they happy the entire time, but so was their adorable pup, Zoey. We explored Allaire State Park and found some really great locations. One thing I love about their session was the reoccurring theme of Dave making Katie laugh- non-stop! Dave's got plenty of jokes and Katie loves them all- I love this about them! I can only imagine how many genuine smiles I'm going to capture on their wedding day. Meg and Eric have been wedding planning from Chicago, so when their wedding day arrived and I finally got to meet them in person- I was beyond excited. Meg is the kind of girl you've always wanted to be friends with- she's so funny, sweet, and shares all of her emotion- she lights up a room! When Meg and Eric get together their chemistry is undeniable! They are so sweet and kind to each other and I'm beyond happy for them- I can't imagine how happy their family is for them, witnessing a perfect match. Both bride and groom started at The Westin hotel in Mount Laurel, NJ for their getting ready. Meg and her bridesmaids prepped and shared so many special moments while Eric got.... a haircut in his hotel room! I was so excited for my second photographer, Danielle, that she was going to be able to capture it (maybe a little jealous too)! It's a wedding day first, and soooo much fun. Meg put on her gorgeous gown at the Collingswood Grand Ballroom before meeting her groom outside for their First Look, with their family and friends watching from afar. We were able to capture their bridal party, bride and groom portraits, and family portraits before rain clouds started moving in. Their indoor ceremony, complete with a beautifully decorated chuppah by Leigh Florist, and the romantic candles and twinkle lights at the Collingswood Grand Ballroom, made for the perfect setting for their "I do"s. Their reception started with the most fun hora, followed by a lively dance floor and soooo much celebrating for our happy couple. Thank you so much to Mr. and Mrs. Gold for letting us capture your best day ever! I love using the bride's veil to shoot details- makes a dreamy backdrop. How about a fresh haircut on your wedding day?! I love that my second photographer, Danielle, got to capture this! Such a GRAND setting at the Collingswood Grand Ballroom. So timeless and elegant. I love that Meg and Eric invited their bridal party and family to witness their first look- their reactions were sooo worth capturing! LOVE allll the twinkle lights at the Collingswood Grand Ballroom. If you've been following me for a while, you might know that I have a special place in my heart for beach weddings and more specifically, at The Flanders Hotel, in Ocean City, New Jersey. The hotel has a very classic feeling with antique furniture, and gold trim, just steps away from the boardwalk and beach. The Ocean City boardwalk is so vibrant with shops, rides, and murals on the walls overlooking the beach. All of the liveliness of this beach town draws brides and grooms here each year for their wedding- including myself and my husband eight years ago. When it was time to make some new sample wedding albums this year, I chose Tracy and Don's wedding at The Flanders Hotel- it was SUCH a great day. I love my heirloom wedding albums. The cover options range from the most vibrant linens, to rich, luxe leathers and I'm a sucker for debossing. You'll see "Don & Tracy" debossed on the cover, stamped right onto the cover in such a timeless font. The photographs are printed onto the pages and the pages are as thick as a nickel. Here are a few of my favorite spreads from Tracy and Don's album. I'll also say, in the digital age we live in, couples don't always purchase wedding albums at the time of their wedding and then they feel stuck a year or two (or more!) later and not quite sure how to go about it. It's NEVER too late to get an album! It's a family heirloom that tells the story of the beginning of your family. If you're a Styled Pink couple and are wanting your very own album- let me know! I'll admit, I'm not a huge football fan, but you know what I am a fan of? The community sharing in something special. It's been so much fun to watch my daughters' preschool chanting for the Eagles, to hear the Eagles' Victory Song being played on the organ at church, and getting ready to gather with family for good food and good times. So here's the best tribute I've got- Go Eagles! ALL photos below were taken in Philadelphia OR with Philadelphia in view! What's your favorite place to visit in Philadelphia? Mike and Rina danced the night away at the South Street Bridge in Philadelphia for their engagement session. 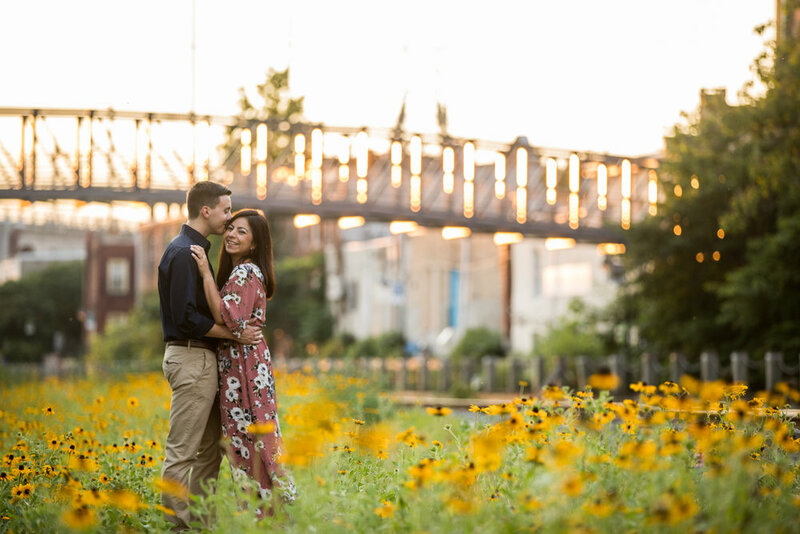 Paula and Frankie found a field of gorgeous sunflowers at their Manayunk engagement session. Mike and Miranda cuddle up at their Rittenhouse Square anniversary session in Philadelphia. Mallory and Steve find the most gorgeous sunlight walking down the streets of Philadelphia. Mike and Rina's wedding at the Adventure Aquarium in Camden, New Jersey, overlooks Center City in Philadelphia. Zane and Deana's super secret location in Wissahickon Trail in Philadelphia. It still baffles me that THIS is Philadelphia! Elizabeth and Phil strolling around FDR Park in Philadelphia. Paul and Christy at the base of the Ben Franklin Bridge. I LOVE that blue! Clayton and Colleen cuddle up in the Piazza before heading into their wedding reception at Tendenza in Philadelphia. Jamie and Pete snuggle up for an amazing sunset near the Tacony-Palmyra Bridge leading into Philadelphia. Deana and Zane are MARRIED and loving every minute of it in Washington Square Park in Philadelphia. Christine and Nick in the middle of the action by City Hall in Philadelphia. Jaclyn and Parker spend a summer evening at Spruce Street Harbor in Philadelphia. Kate and Jeff visit the quaint and cozy Elfreth's Alley. 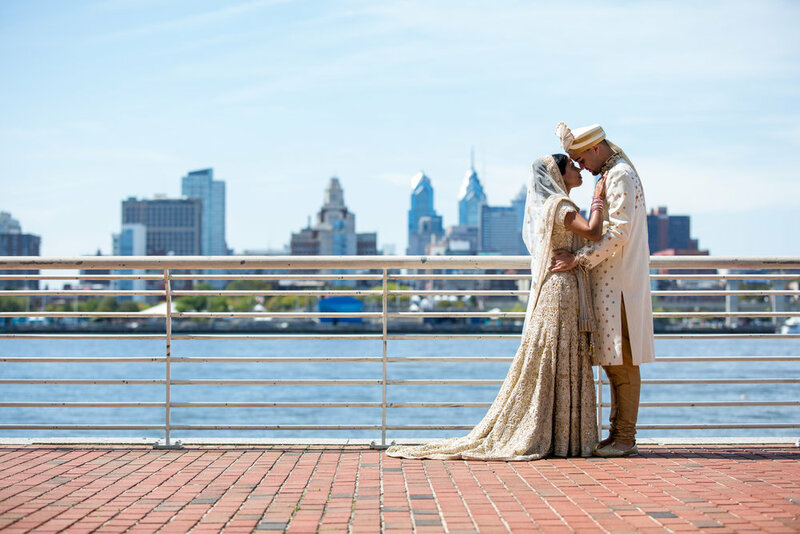 Are you getting married in Philadelphia and looking for a wedding photographer to capture it all? Email me at diana@styledpink.com! On a Sunday evening in July, I met with Parker and Jaclyn in Philadelphia. The plan was to shoot in some of the most meaningful places to them including Penn's Landing and Downey's (where they had their first date). The city was bustling with visitors, delicious-smelling food in the air, and gorgeous colored lights as we stumbled upon Spruce Street Harbor. We found gorgeous flowers, hugely colorful ships and (the best) a mural of Mario (and Luigi) near a small arcade. Parker and Jaclyn stopped at a pop-up beer garden for a glass of their favorite brew as we started our way back towards Penn's Landing. I love the way that Parker makes Jaclyn laugh- I'm sure he's become quite the expert in this when they first started began dating in their long-distance relationship. As clouds rolled in, Jaclyn reminded me that she would definitely be okay with a few shots in the rain, and that it was actually encouraged! We managed to get a couple of shots between the rain drops before the thunder began. 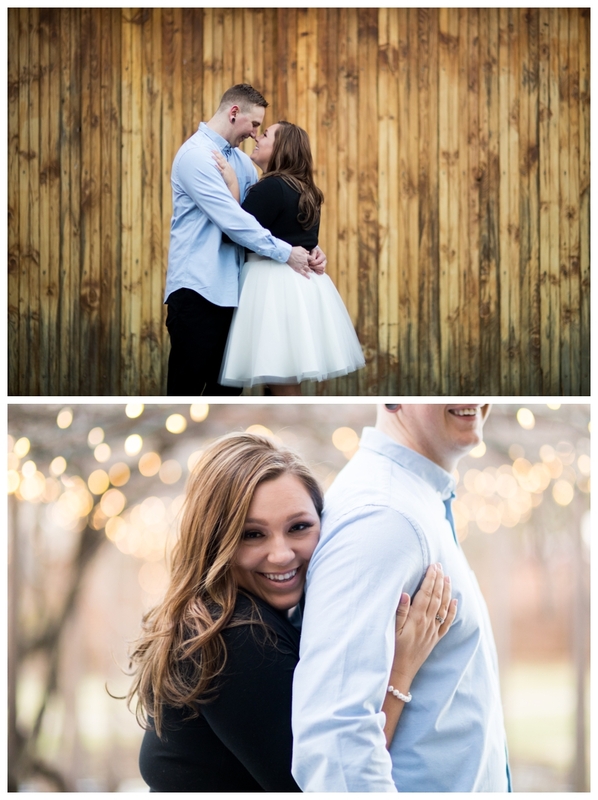 I'm so excited to have photographed their engagement! I love to get to know my couples so that on their wedding day, I'm not just a stranger, but a friend, ready to document their day. Their day is coming up really soon- just under two months!